Thank you for your letter dated November 11th 2008. Thank you also for the new appointment you have offered me for December 1st 2008. When you informed me in your letter dated September 23rd 2008 that you did not wish to give me your e-mail address (for confidentiality reasons), I decided -- in desperation to a very large extent -- to try and communicate with you by e-mail via the Health Service Executive (Republic of Ireland), which I assume is your employer judging from the headed notepaper you have used: in the hope that they might find a means of passing on my e-mails to you in a manner which met with your own confidentiality requirements, and with those of the Health Service Executive. Please note that due to the largely well-hidden nature (as I see things) of the political, legal, and medical difficulties I have been struggling badly with for the past several years now, I have long since come to believe that confidentiality is much more of a hindrance than a help to me. Consequently, and I feel I should try to stress this point, I do not seek, or want, confidentiality regarding the matters I am writing to you about -- either from yourself, or from any of the other recipients of this e-mail. With due regard for the set of political and legal issues (and the associated evidence of wrongdoing involving extreme lawlessness ) which I have set out at http://www.humanrightsireland.com/PrimeMinisterCowen/9May2008/Email.htm , it appears to me that there is now an overwhelming mass of high-quality evidence available on the Internet which supports the growing international viewpoint that cliques of wealthy and highly influential "ruling elites" (as they are sometimes referred to) are violating national and international law, in very major ways, and with complete impunity. And, that in the process, that they are leaving a huge and very varied array of social ills, illnesses, and injuries in their wake, plus thousands and thousands of dead bodies as well of course (in places like Iraq for example): many of them belonging to completely innocent young children, and many of them smashed into smithereens in the middle of the night by Cruise Missiles and suchlike. By way of providing you with an example of the kind of difficulty I personally face in connection with some aspects of the "extreme lawlessness" phenomenon which has trickled down into my life, please note that: a) I have still not received any reply of any kind from hospital consultant psychiatrist Dr Thomas Foster to the letter I sent him on August 11th 2008 (the text of which can be viewed at http://www.humanrightsireland.com/DrThomasFoster/11August2008/Letter.htm ), and, b) that I have been informed the Northern Ireland Police Ombudsman intends to take no action regarding any of the three matters listed at the end of the e-mail I sent to Gerard Madden (Senior Social Worker) on September 21st 2008 (a copy of which can be viewed at http://www.humanrightsireland.com/GerardMadden/21September2008/Email.htm ). Another major "spin-off" type of medical difficulty for me relates to the fact that none of the concerns I raised in my letter dated March 3rd 2008 to hospital consultant CK Mulholland (copy available at http://www.humanrightsireland.com/CKMulholland/3March2008/Letter.htm ) have been addressed (as far as I know); and, that while they remain unaddressed, I believe I will continue to feel completely unsafe about presenting myself for surgical procedures which I would (in normal circumstances) have gladly consented to last March: and even though I have all along been fully aware that delays regarding this particular matter might well have life-threatening implications for me. All things considered, and with due regard for the contents of this e-mail, I feel I should now ask you (and the Health Service Executive) to please review my case. Provided I receive a written assurance from you, on or before Thursday November 27th 2008, to the effect that you have received (and read) the e-mails I have sent to you in recent weeks, I am happy to keep the December 1st 2008 appointment you have made for me. If, for any reason, you cannot provide me with this written assurance which I am now requesting from you, please note that I have decided it would be best for me not to attend the December 1st 2008 appointment. Should you decide to now review my case (as requested above), it may help you to know that all of the e-mails I have tried to send to you, via the Health Service Executive (using their info@hse.ie address), can be viewed by anybody with access to the Internet via the list provided at http://www.humanrightsireland.com . 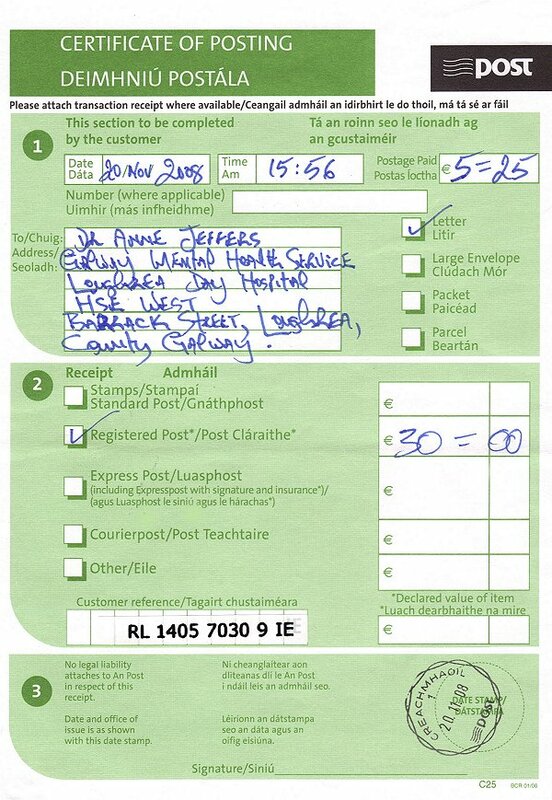 A printed and signed copy of the above e-mail was also sent by registered post to Dr Anne Jeffers on November 20th 2008. As can be verified via the web address just above, the November 20th 2008 letter to Dr Jeffers was successfully delivered on November 21st 2008.